This year marks the 27th anniversary for the Westcott Street Cultural Festival! This amazing, one- day neighborhood event embraces diversity and fosters a sense of community in the Westcott neighborhood. More than 8,000 people gather to enjoy music and dance at the seven stages, visit the arts & crafts booths and learn about local not-for profit agencies. Festivities start with a kickoff parade at noon and continue until 6:30 PM. We need you! The success of this event is highly dependent on volunteers. Last year more than one hundred students from Syracuse University volunteered at the Fair. Community service hours range from 10:30am-8pm. Volunteer assignments include monitoring street barricades, facilitating activities with kids, managing the stages, clean up at the end of a busy day or assisting at the volunteer check in table. Sign up solo, with a friend, or even as a group! If you would like to be an integral part of this volunteer effort, the process is simple. 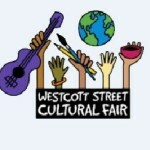 Just go to the form for the Westcott Street Cultural Fair and submit. You will receive an email in the near future with your assignment. At the end of your shift you will receive a signed certificate to verify your service hours. For more information or if you have any questions, please do not hesitate to give our office a call at ejwiniec@syr.edu or 315-447-5779. Thanks for your support!